Edited to add: Before things get out of hand, I need to add: I do not have an offer yet. I am just optimistic. I can't believe I have less than 48 hours left in the United States! As a parting gift, Mother Nature sent me a respectable amount of snowfall a few nights ago. For some reason, the way the sidewalks are shoveled, it forms a neat shelf of snow that remind me of chocolate sheet cake with marshmallow frosting. True story. It won't be long before I'm back in the Philippines, staring dejectedly once again at the weighing scale. It can't be as bad as my last stay here... Can it? The cold wasn't as bad as the last time, but my resolve not to overdo going out and spending (sometimes to get all-new ingredients for something, as it's not my kitchen I'm cooking in) has fueled my sloth, which is probably not so bad considering WHEN (hehe... THE SECRET! lol) I get that residency this coming July, I will not have a moment to catch my breath. Which, if you knew me from before this blog, is my "zone", though I do a better job than most at keeping "zen". I'm not going to write too much about that now (don't want to jinx it), so instead I'm going to go right into this recipe that I only started to make when I got to San Francisco last November. Probably for the best, considering what are sold as zucchini in the Manila is actually what is known as Montezuma Squash in the US. Not that it would adversely affect the recipe (though I have a feeling Montezumas are a lot more liquidy). Anyway, I plucked this recipe from my Tartine cookbook when my aunt (my dad's cousin, what you'd consider my cousin here in the US) raved about a healthified version of zucchini bread that a friend had made. It made two smaller loaves, but had whole wheat flour (not a fan, especially if you have to buy a fresh big ol' bag just to make it) and 300g sugar. I had complete faith in Tartine -- I was in San Francisco, after all -- so I encouraged her to try it with me. Well, I ended up making it probably 4 times in the nearly two months I was there. We weren't giving it away or anything: we were just eating it among ourselves. It was just that good. The addition of orange marmalade accounts for part of the sweetness but gives it a slightly bitter, sophisticated touch. 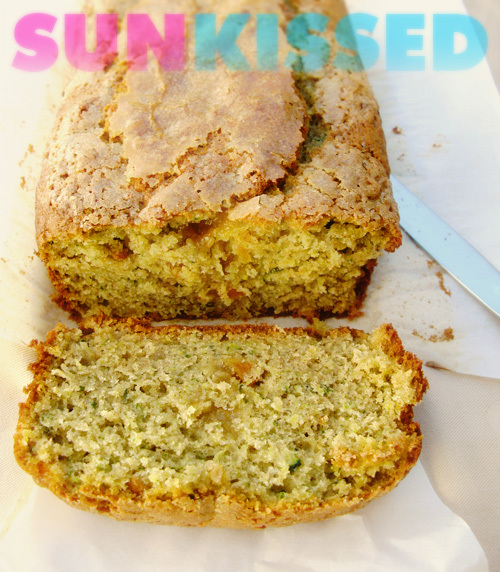 It's probably as perfect a Zucchini Bread recipe as I can think of. It wasn't self-consciously health-ified, but it was inherently pretty healthy and uncompromisingly good. And really, what more can you ask for? This is from the Tartine Cookbook, which I reviewed for The Gastronomer's Bookshelf. Spray, line, and spray again a 23cm x 12.5cm (9x5 inch) loaf pan and set aside (you can also just spray if you're confident about your pan's non-stickiness). Preheat the oven to 175°C (350°F). Mix all these ingredients (except the walnuts, if using) in a large bowl until combined (no giant lumps of marmalade at least), then sift the dry ingredients into it and stir until just combined (don't worry about it being smooth, just be gentle). Stir in the walnuts if using. Pour into the prepared loaf pan. Sprinkle the top with the 2 tablespoons sugar (but I find I don't usually use it all up, actually). Bake for 60-70 minutes or until a toothpick in the center comes out clean.